What’s the purpose of a movie remake? More specifically, what’s the purpose of an American remake of an existing (and usually acclaimed) foreign film? Whenever they’re announced, everyone involved makes sure to stress in interviews that it’s all about honoring what’s great about the source material while, at the same time, telling a story that’s relevant to the world right now. Certainly that’s been the party line whenever the cast and crew of Ghost in the Shell discuss the movie, itself an adaptation of a famous Japanese comic series from 1989 that was already made into an iconic anime film in 1995. And for once, there’s some reason to believe them: Ghost in the Shell is a look at a world where humanity and technology have begun to converge, a possibility that’s way less theoretical in 2017 than it was almost 30 years ago. However, there’s a less flattering reason why these remakes exist: The U.S. is virtually the only country on Earth that refuses to see foreign-language movies. Our own blockbusters do huge business abroad, but the average American has almost no contact with foreign cinema. (Unadjusted for inflation, only one foreign-language movie has ever made more than 100 million dollars in the United States: 2000’s Crouching Tiger, Hidden Dragon. To put that in perspective, Marvel’s The Avengers made 207 million dollars on its first weekend alone.) And at a time when Hollywood is desperate for something, anything, that could provide the basis for a new franchise, remaking cult foreign films as would-be blockbusters for the masses seems like good business. Whether it’s a good idea is another matter. Sadly, director Rupert Sanders has a great eye but no feel for this material at all. 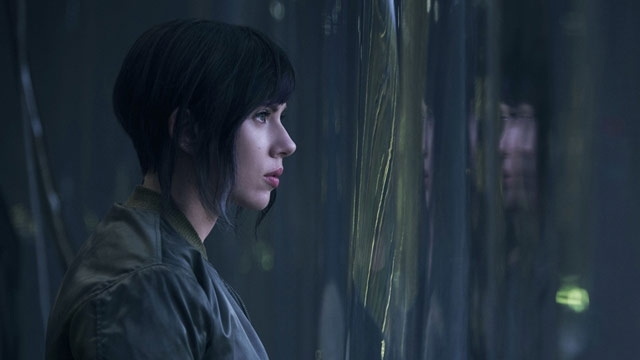 This Ghost in the Shell has a ton of great individual shots—there’s a reason why its trailers looked compelling—but they’re strung along on a story line that’s completely inert. The plot centers on a woman known as the Major (Scarlett Johansson), who symbolizes the truest fusion of humanity and technology: She has a human brain and a completely artificial, robotic body. The Major works for a vaguely defined law-enforcement unit called Section 9, who are in the process of hunting a hacker able to enter and control the brains of human beings (in this future, almost everyone has a data port at the base of their neck that allows them to upload information). Murders pile up, the team investigates, and the trail of evidence leads straight back to the corporation that gave the Major her new body. That’s an intriguing setup, but clearly nobody worked that hard to flesh it out. The plot is dumb enough that one murder victim has a hard drive sticking out of her pocket that immediately displays all of the other potential targets. Meanwhile, the characters all speak in the same hushed, emotionless tone of voice, as if they were deadened by life itself; when a man they’ve taken into custody unexpectedly commits suicide in front of them, the Major and her partner, Batou (Pilou Asbæk), just kinda shrug and turn away. And the dialogue is wall-to-wall exposition about what’s happening in the plot and how every piece of technology works. Even when that technology looks pretty damn cool, the movie doesn’t know what to do with it. The story’s basic conceit is that humanity has started to embrace body modifications, but not once does this Ghost in the Shell show how that’s changed society. For example, the Major and her team all have implants that allow them to communicate telepathically, but we mostly see them using this function during SWAT-like raids—they might as well be using shoulder-mounted walkie-talkies for all the good it does them. It makes you wonder what technology like that would do to the average person: What would our romantic relationships be like, for instance, if hearing someone else’s thoughts were possible? There’s no world-building here at all that explores any of these possibilities; the humanity of the future is just a deadened mass that doesn’t seem to respond to much of anything. And this gets at the heart of why remaking Ghost in the Shell, at least without rethinking it at all, was such a bad idea. The original comic and anime film explored the provocative idea that leaving behind one’s human individuality to become something else was a valid choice, one that didn’t automatically amount to damnation or being “less” than human. But this idea emerged from Japanese culture, which places a much stronger emphasis on collective harmony over individualism, and which has a different relationship with technology and robotics that makes them more comfortable with machines performing basic tasks in society. American culture isn’t like this at all, which means that the basic plot outline of Ghost in the Shell has been jammed into a typical blockbuster narrative about the self-actualization of a Chosen One, and set in a world where technology is always depicted as corrosive to the soul—two small choices that accidentally undermine everything this story was originally trying to say. Of course, the filmmakers could have dug a little deeper and come up with their own view of this world that said something completely different—but there’s no room for that kind of thinking in the remake business.